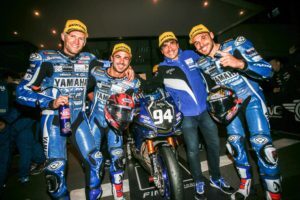 To offer to everybody the possibility to live motorbike racing is in GMT94’s DNA. You support GMT94 ? The registration is totally free, and will allow to share a common passion. A personal card will be freely send, with your photo and a member number. It will be needed to beneficiate special prizes on events we negociate with, as Magny-Cours World Superbike for example, but also for discounts on our store online and some of our partners. This association fully dedicated to its members, gets one goal : bringing you inside the race. To register, you just have to click here. You can win one of the five GMT94 outfits (t-shirt, softshell,cap) available. Answer on December 18th !